Wash the rice till the water runs clear. Soak the rice in cold water for 1/2 an hour and drain. Heat Ghee, and add cardamom, cinnamon and clove. When they start to sizzle and splutter add the rice. Stir for sometime till the ghee coats the rice. Now add the Cumin seeds. Make sure not to add the Cumin seeds directly in the ghee, as this will darken the cumin and give a different flavor. Add salt and fry for some more time, about 5 more minutes. Increase the heat. Add 2 cups of water and let the water boil. When you see no water over the surface of the rice, cover it and immediately switch off the heat. Be very careful during this time as more heat or delay may burn the rice at the bottom of the pan. Let it stay covered for another 10-15 minutes. Always had tough time cooking tasteful rice dishes. Either they are too elaborate or fall too flat. I have searched many websites and good cooking books, and the result = always messed up ! Either I over cooked the spices or added too much water or didnt know when to turn the heat off. Thanks to eCurry ! U just know how to cater to the palate. This is my first successful rice dish made to perfection. Its easy and delicious ! I love the flavor of “jeera” on rice. 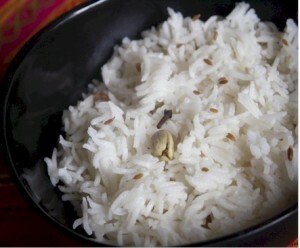 I love rice they are best source of carbohydrates and minerals. It is suite in the morning for working people. Does anyone know how to adapt this recipe to use in a rice cooker (fuzzy logic)? Thanks. Switch on the cooker with the bowl in place. Add the ghee in a bowl and let it heat for a while ( a minute maybe). Add the clove, cinnamon, cumin the spices to the ghee and cover the cooker for a minute. Open the cooker and add the rice and the salt and stir to combine- the ghee should coat the rice. Cook opened for a couple of minutes or till the rice looks glazed. add water (add about 1/2 cup less water than you would to cook rice as per the rice cooker instruction) – as the rice should be separate and not mushy. Cook as per instruction of the rice cooker. I make this often in my rice cooker in the above method and it works pretty well. Hope this helps. Good luck! !